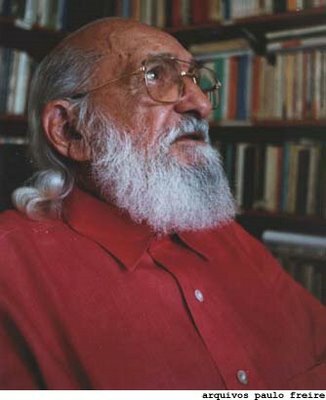 Paulo Freire was one of the most influential educators of the 20th century. Born in 1921 in Recife Brazil, Freire attended University there and became interested in Marxism. He simultaneously maintained a commitment to "Christianity" and his brand of Christian Marxism has made a major contribution to the "Liberation Theology" that has swept the third world (and pockets of our own). His work has inspired countless Catholic priests, nuns and laity to support Marxist revolution, especially in the Philippines and Latin America. In NZ he has had a big impact amongst educational academics, radical Maori and "Christian" and "community" activists. Even Maori Party leader, Tariana Turia, has been known to quote him. Below are excerpts from a sympathetic biography by Peter McLaren a Professor at UCLA and an Associate of the Paulo Freire Institute in Brazil. All emphasis is my own. "Paulo Freire died May 2, 1997. As a courageous and humble scholar, social activist, and cultural worker, Freire was able to develop an anti-imperalist and anti-capitalist literacy praxis that served as the foundation for a more broadly based struggle for liberation. Freire's internationally celebrated work with the poor began in the late 1940s and continued unabated until 1964, when a right-wing military coup overthrew the democratically elected government of President Joao Goulart. Freire was accused of preaching communism and arrested. He was imprisoned by the military government for seventy days, and exiled for his work in the national literacy campaign, of which he had served as director. Freire's 16 years of exile were tumultuous and productive times: a five-year stay in Chile as a UNESCO consultant with the Research and Training Institute for Agrarian Reform; an appointment in 1969 to Harvard University's Center for Studies in Development and Social Change; a move to Geneva, Switzerland in 1970 as consultant to the Office of Education of the World Council of Churches, where he developed literacy programs for Tanzania and Guinea-Bissau that focused on the re-Africanization of their countries; the development of literacy programs in some postrevolutionary former Portuguese colonies such as Angola and Mozambique, assisting the government of Peru and Nicaragua with their literacy campaigns; the establishment of the Institute of Cultural Action in Geneva in 1971; a brief return to Chile after Salvador Allende was assassinated in 1973, provoking General Pinochet to declare Freire a subversive; and his brief visit to Brazil under a political amnesty in 1979 and his final return to Brazil in 1980 to teach at the Pontificia Universidade Catolica de Sao Paulo and the Universidade de Campinas in Sao Paulo. These events were accompanied by numerous works, most notably "Pedagogy of the Oppressed", "Cultural Action for Freedom" and "Pedagogy in Process: Letters to Guinea-Bissau". In more recent years, Freire worked briefly as Secretary of Education of Sao Paulo, continuing his radical agenda of literacy reform for the people of that city. Based on a recognition of the cultural underpinnings of folk traditions and the importance of the collective construction of knowledge, Freire's literacy programs for disempowered peasants are now employed in countries all over the world. By linking the categories of history, politics, economics, and class to the concepts of culture and power, Freire has managed to develop both a language of critique and a language of hope that work conjointly and dialectically and which have proven successful in helping generations of disenfranchised peoples to liberate themselves. With a liberating pedagogy such as Freire's, educators and cultural workers in the US and elsewhere have an opportunity to engage in a global struggle for transforming existing relations of power and privilege in the interest of greater social justice and human freedom. What is remarkable about Freire's work is that it continues to be vigorously engaged by scholars in numerous disciplines: literary theory; composition; philosophy; ethnography; political science; sociology; teacher education; theology, etc. He has given the word "educator" a new meaning, inflecting the term to embrace multiple perspectives: border intellectual; social activist; critical researcher; moral agent; radical philosopher; political revolutionary. Freire believed that the challenge of transforming schools should be directed at overcoming socio-economic injustice linked to the political and economic structures of society. Freire's approach stipulates a trenchant understanding of patterns of redistribution in order to transform the underlying economic structures that produce relations of exploitation. Freire was also concerned with practicing a politics of diversity and self affirmation - in short, a cultural politics - but not as a mere end-in-itself, but rather in relation to a larger politics of liberation and social justice. Liberal progressives are drawn to Freire's humanism; Marxists and neo-Marxists are drawn to his revolutionary praxis and his history of working with revolutionary political regimes; left liberals are drawn to his critical utopianism. The globalization of capital, the move toward post-Fordist economic arrangements of flexible specialization, and the consolidation of neo-liberal educational policies demands not only a vigorous and ongoing engagement with Freire's work, but also a re-invention of Freire in the context of current debates over information technologies, global economic restructuring, and the struggle to develop new modes of revolutionary struggle. The week after his unexpected death, Freire was scheduled to attend a ceremony in Cuba where Fidel Castro was to present him with a major award for his contribution to education. According to his friends, this was to be the most important award of Freire's life." Note; It would be interesting to find out if the Cuban "literacy programmes" being offered by te Wananga o Aotearoa in Te Awamutu, are "Freire" based. What's the bet? What's Bloody Loudon on About?